Hi everyone its Deb again with an update on Magnifying mirror stock. With the advent of new stock landing next week I thought it timely to remind you of how the website is operated as we know some customers like to call and ask "what's going on I can't find the magnifying mirror I wanted to buy on your site." 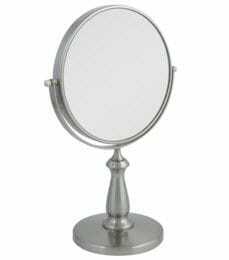 You may also be wondering why you sometimes cannot find a magnifying mirror in the web store you saw previously and wanted to buy. We receive calls periodically from customers inquiring about a magnifying mirror they saw on the MyHealthandBeauty site last week, or they were reading the blog post about a new model and the link to the mirror and its details do not work. We always do our best not to disappoint; our reasoning is when stock reaches Nil in the warehouse we remove the mirror from the website until it comes back into stock. It's not fair to inconvenience you by taking payments and then being advised there is no stock and making you wait. The mirrors will be put back online as soon as we have a fixed date fo the stock to be back in the warehouse. Sometimes the mirror will appear back on the site as soon as we have a fixed date of arrival. That date is messaged across the mirror. The less we can inconvenience you the better. We also want you to know that we pack and post the same day as your order which generally means if Australia post is on track you should receive your parcel inside 3 or 4 days at the very worst. The team at myhealthandbeauty wants to ensure you have a good experience and making sure customers receive their purchases as fast as possible is part of our plan. If your parcel has not arrived within a week please don't leave it for two weeks before you call. Our systems can get to the issue very quickly why your purchase has not been received. Our latest shipment is about to land; on-board we have the new upgraded travel magnifying mirror with lights model and the popular lighted purse mirror, along with two different style in-shower mirrors. These mirrors will be back online next week. I will review the updated lighted magnifying travel mirror for you when they come in stock so you can make an informed decision. Until then remember to smile and try not take yourself too seriously.